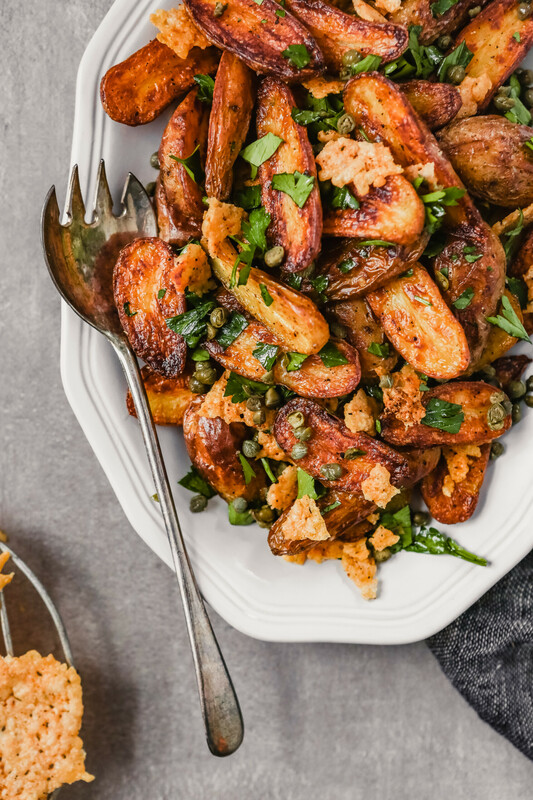 Not much else compares to crispy roast potatoes. Or more to the point, any kind of crispy potato. Fried, smashed, sautéed, whatever, I don’t care. As long as it’s crispy and salty, I’m in. 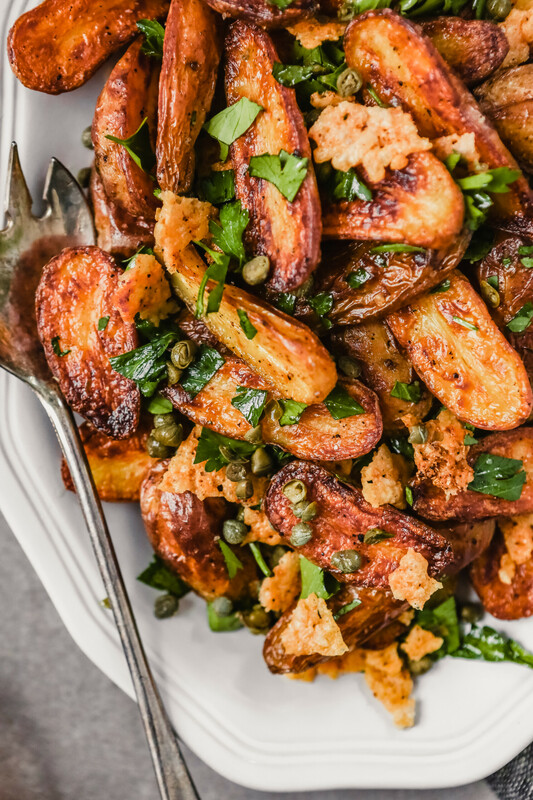 But these crispy fingerling potatoes take the cake for me. They hit all the boxes. And cheesy, because why not. 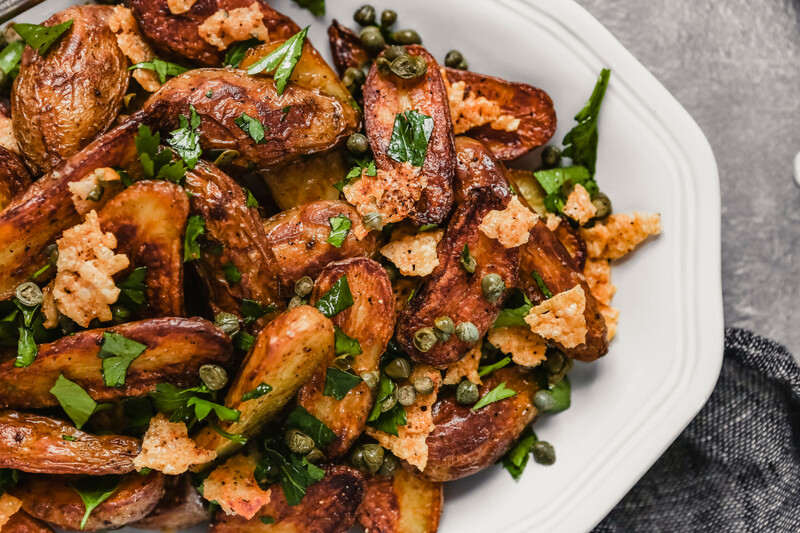 With just 5 ingredients (not counting oil, salt and pepper) these potatoes are simple, which is partially why they’re so good. This recipe utilizes a handful of quality ingredients, which results in a side dish that’s no fuss and all flavor. Capers add brininess while homemade Frico (cheese crisps—so easy) add salt, umami and crunch. Then finally a sprinkling of parsley adds just enough freshness to round out the whole dish. 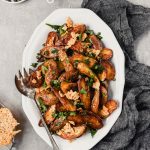 How do you make crispy fingerling potatoes? Parboil your potatoes before roasting. Why? This jump starts the cooking process and ensures that the potatoes will be cooked through after roasting for a short amount of time (relatively) at a high temperature. Why? It’s important for the potatoes to be evenly coated with oil for even browning and crisping. But don’t shy away, these aren’t laden with fat by any means. Set a baking sheet inside the oven while it preheats. Why? The moment the potatoes hit the hot baking sheet they start cooking and crisping!). Roast the potatoes at a high temperature and set in the lower third of the oven. Why? It will take far too long to achieve browning and crispiness if potatoes are baked at a low temperature. 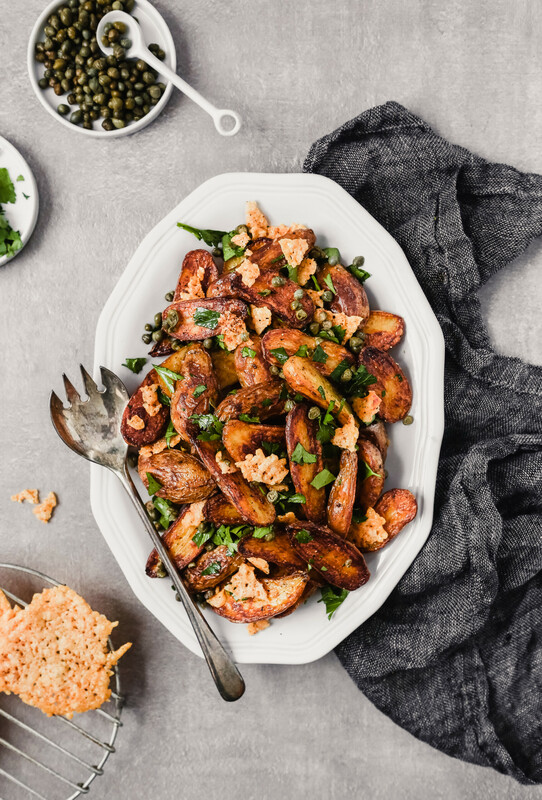 Plus, the longer the potatoes roast the more dehydrated they get, which takes away the incredible creaminess fingerlings are known for. Additionally, roasting in the lower-third of the oven means the potatoes are closer to the heating element which again, means more browning and faster browning. What are (Parmesan) Frico and how do you make them? 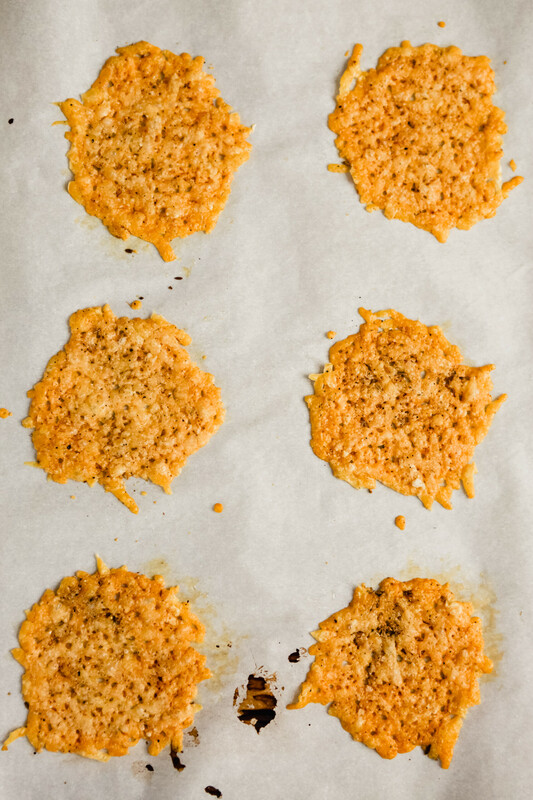 A classic Italian appetizer or garnish, Frico are essentially cheese crisps or wafers. They’re made by mounding grated cheese onto a heated nonstick skillet and cooking until bubbly and golden brown. 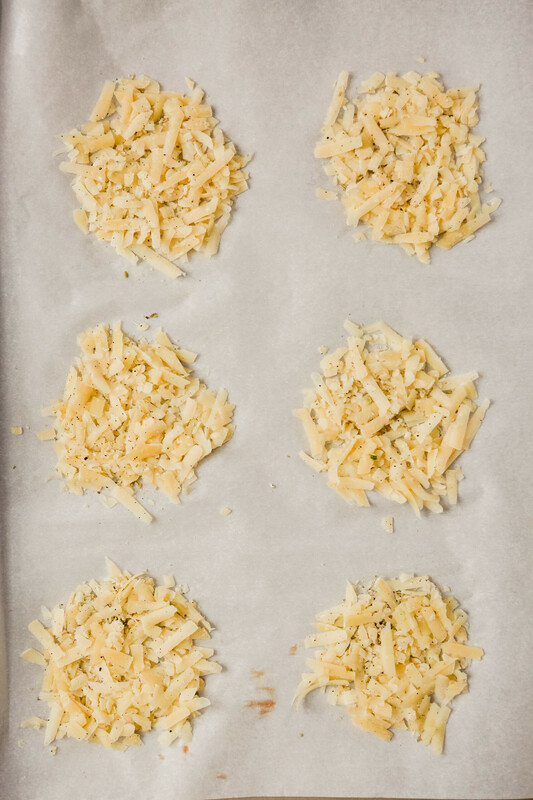 An easier, more modern method is to bake the grated cheese on a parchment-lined baking sheet. The Frico cool slightly on the baking sheet before being transferred to a wire rack, using a thin metal spatula, to cool and crisp up. What kind of cheese can be used to make Frico? No matter the cheese, it should be grated on a large-hole grater before being spooned onto the baking sheet or skillet. 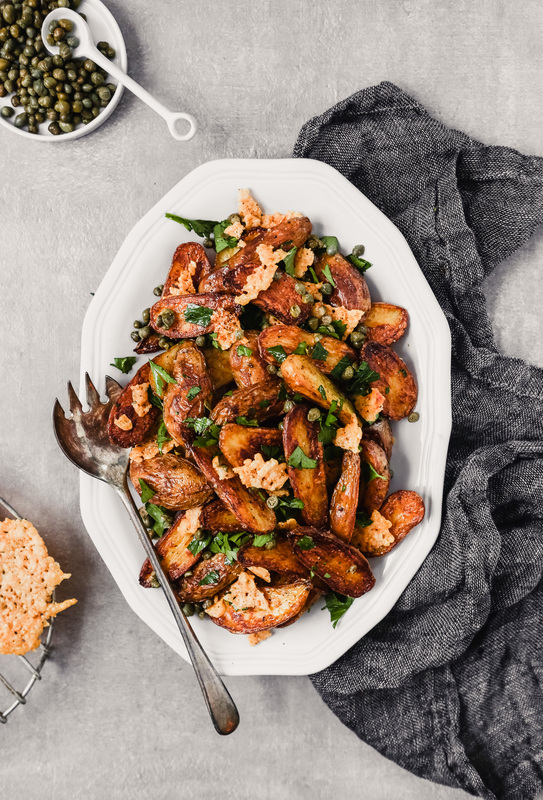 What do you serve crispy potatoes with? 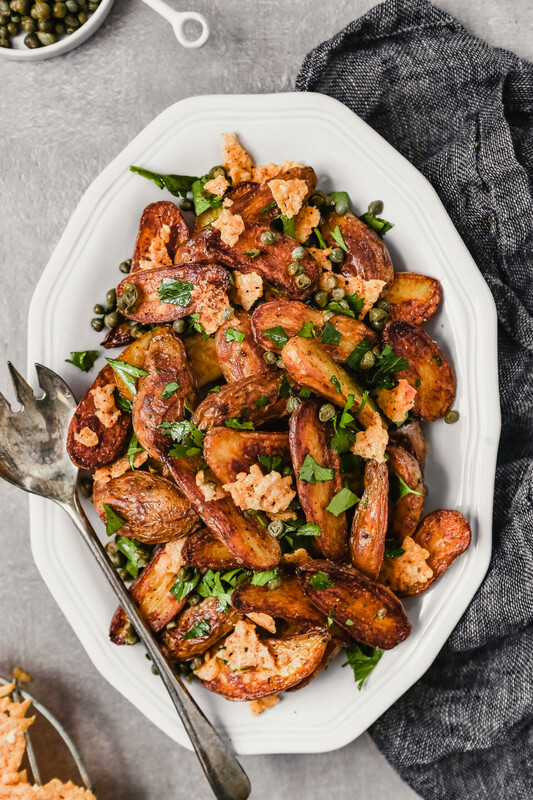 Crispy potatoes are so darn universal, you can serve them with just about anything. Here are some of my favorite dishes to serve them with. 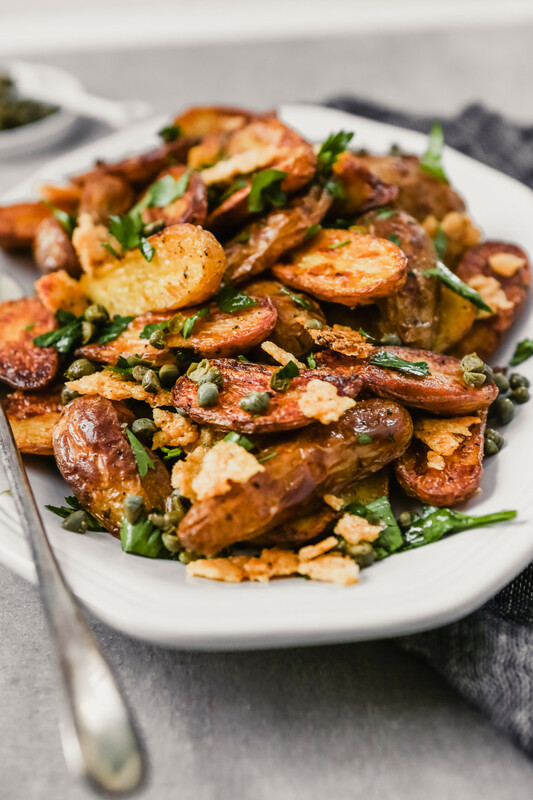 These crispy fingerling potatoes are featured in ZK’s Easy Sunday Night Tuscan Dinner! Check out the full menu.